So I finished the hat, and started back to work on my red socks... which stubbornly refuse to show any progress..The still aren't 6 inches long, (I am convinced they will be!) but I continue to work a round or two between breaks. The, meanwhile, I have cast on for a pretty lacy scarf—This one you can find in my Ravelry shop. Its an inexpensive pattern—but I really think a scarf like this, with just one lace pattern (no matter how complex the lace pattern) for the whole thing shouldn't be that expensive. I love this almost rib lace pattern—but it isn't as easy as it first looks. The “repeat” is 6 (stitches) –only its not. Half the rows are 6 stitches, and half of the rows are 7. Some rows are dead easy, (K3, P3)--but there are decreases and YO on the purl side –just to keep you on your toes. I prefer written out patterns most often, so my pattern has written directions, too. I have just about got it memorized—the first time I made this pattern it took me almost 30 inches to do that! I am working on a size 5 needle, using Anne Modesitt's Werks—a sock weight gradient yarn that I recently treated myself too. The previous version was done in a silk blend-. But this yarn is, in some ways, prettier. I like the gradual color changes from greens to blues.. very watery colors. Finally! Sometime yesterday I knit the magic row, and suddenly—the stuck sock, grew—and now its 6 and a bit. 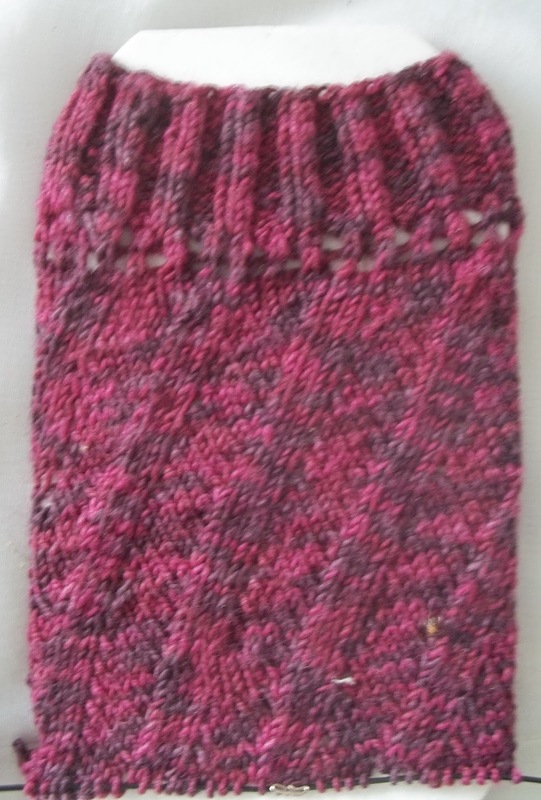 I am going to do a few more rows, and bring it up to 6.5 inches before I start the heel.